List of theory examination Centres for BAMS 1st to 4th Year/Prof., B. Pharmacy 1st to 4th Year,D. Pharmacy 1st and 2nd Year, MBBS 3rd Prof. Part-I, B.Sc. Medical Radiotherapy, Radiography and Imaging Technology and Perfusion Technology, Medical Technology (OT), Optometry and MLT 1st, 2nd and 3rd Year, BPO, M.Phil 1st and 2nd Year and BPT 1st to 4th, M. Pharmacy 1st Year Annual/Supple. Examinations 2018-19 commencing w.e.f. 19.04.2019, 23.04.2019 and 30.04.2019 respectively. Theory date sheet of MDS Final Year Annual Examination, 2019-20. TENTATIVE SCHEDULE OF EXAMINATIONS OF VARIOUS MEDICAL COURSES TO BE CONDUCTED DURING THE YEAR 2019-20. 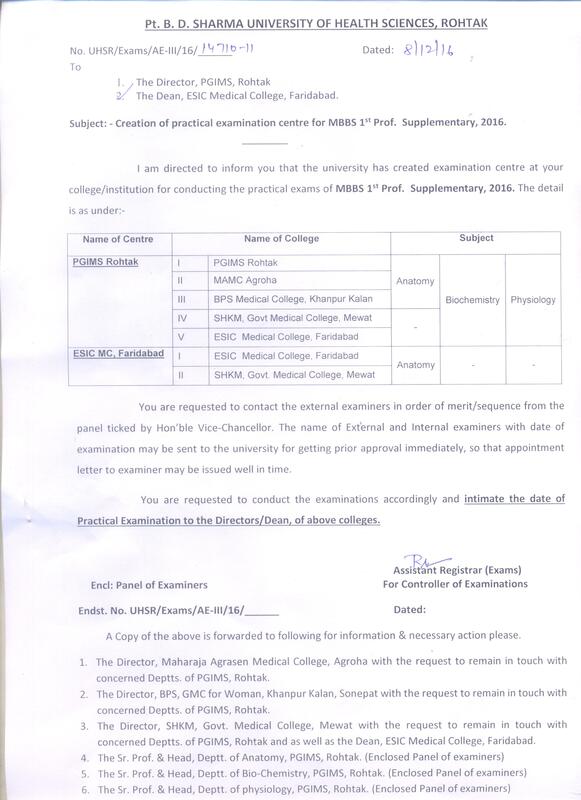 List of theory examination Cntres for MBBS 3rd Prof. Part-II, BDS 1st, 2nd, 3rd 4th Year Supplementary Examination, 2018-19 commencing w.e.f. 26.02.2019. THEORY DATE SHEET OF MBBS 3rd PROF. PART-II, SUPPLEMENTARY EXAMINATIONS 2018-19. Tentative Theory Date Sheet of B.Pharmacy M.Pharmacy 1st semester Annual/ Supplementry and B.Pharmacy 3rd Semester Annual examination 2018-19. The link for filling up the examination forms for all eligible students through the online portal for the BASLP, BHMS, B.Sc. NURSING MPT EXAMINATIONS 2018-19 is now functional. Tentative Theory Date sheet of BASLP 1st, 2nd 3rd Year Annual Exams, 2018-19. Tentative Theory Date sheet of MPT 1st 2nd Year Annual Exams, 2018-19. THEORY DATE SHEET OF MBBS FINAL PROF. PART-II, ANNUAL EXAMINATIONS 2018-19. Tentative Theory Date Sheet for ANM 1st 2nd Year , MPHW(F) 2nd Year, GNM 1st, 2nd, 3rd Year and MPHW (M) 1st 2nd Year Annual/ Supplementary Examinations, 2018-19. Theory Date-sheet for M.Phil 1st and 2nd Year Annual Exams,2018-19. Theory date sheet of MD/MS, PG Diploma, DM M Ch. Final Yr. Supple. Examination, 2018-19. Tentative Theory Date sheet for B.P.O. 1st, 2nd, 3rd4th Year Annual Exams, 2018-19. Theory date sheet of B.Sc. Medical Technology (OT) B. Sc (Optometry) and B. Sc. (MLT) 1st,2nd 3rd year Annual Exams, 2018-19. B.Sc. Medical, Radiotherapy Technology, Radiography Imaging Technology and Perfusion Technology 1st, 2nd 3rd Year Annual Exams 2018-19. Theory date sheet of MDS Final Yr. Supple. Examination, 2018-19. This is for the information of all concerned, that the Common Entrance Test - 2018 for admission to B. Sc. (Nursing)/B.P.T./B.Sc. Optometry/B.Sc. Medical Tech. Operation Theatre(OT)/B.Sc. Medical Lab. Technology (MLT)/B.Sc. Radiotherapy Tech. B.Sc. Radiotherapy Imaging Tech. B.Sc. Perfusion Technology courses scheduled to be held on 2-9-2018 is hereby being rescheduled and shall now be held on 16.9.2018 due to administrative reasons and unavoidable circumstances. The time of examination, Examination Centre Roll Number etc. will remain the same. List of examination centres for theory examinations of B.Pharmacy 1st to 4th year, MDS/MD/MS/DM/M.Ch/PG Diploma M.Pharmacy 1st year Annual/Supple. Exams 2018-19 commencing w.e.f. 06.06.2018, 15.06.18 26.06.18 respectively. This is to notify to all the concerned, that the theory examination for BAMS 4thYear students for the subject of Shalakya Tantra-I had to be cancelled on 16.04.2018 due to certain administrative reasons. The above mentioned examination shall now be held on 23.04.2018.The rest of the schedule of examinations for BAMS 4thyear students shall proceed as per the date sheet notified earlier. The inconvenience caused to the affected students is deeply regretted. 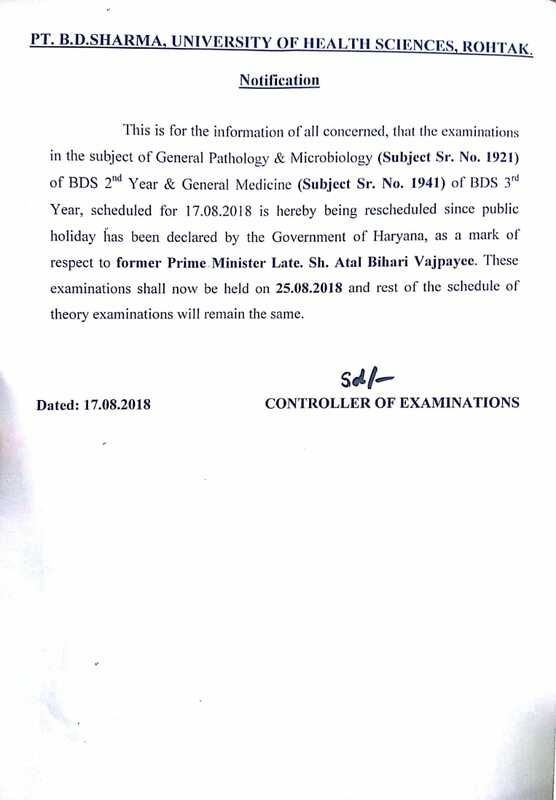 This is for information of all concerned that the date printed on the result/gazette of BDS 1st Year Annual Examination, August, 2017 is 21.12.2017 inadvertently, whereas, the actual date of declaration of said result/gazette is 28.12.2017. So, all the colleges are informed to consider the date of declaration of result is 28.12.2017 instead of 21.12.2017. The Director/Dean/Principal of all the colleges affiliated to this University are requested to check the University website www.uhsr.ac.in regularly for any update/change related to the Examinations/Results and also issue necessary directions/instructions in this regard to the staff and students of the institutions. It is notified for all concerned candidates who are eligible to appear Viva-Voce examination are required to report in the office of Principal, Post Graduate Institute of Dental Sciences, Rohtak at 10:00AM onwards and there will be 50 marks for the said Viva-Voce. It is hereby, notified for all concerned that B.Sc Radiotherapy 3rd year theory exam in the subject of Radiation Detection Measurement held on 10.10.2017 is hereby cancelled and the same will now be held on 17.10.2017 at College of Nursing examination centre from 1:00 PM to 4:00 PM. This is for the information of all concerned that the paper - Applied Technology- Part-II (Subject Code 3042) of B.Sc. Perfusion Technology, 3rdYear Annual 2017, held on 10.10.2017 is hereby cancelled. The same will now be held on 16.10.2017. This is to notify for the information of all concerned that the examination center for conducting the Screening test for the purpose of recognition of UG Dental qualification (BDS) awarded by foreign Institutions/ Authorities in respect to Indian students/ citizens is hereby changed from Lecture Theatre-5, Pt B. D. Sharma PGIMS, Rohtak to Lecture Theatre-I II, PGIDS, Rohtak due to administrative reasons. The other information related to the screening test will remain unchange. This is notified for the information of all concerned that the Screening test for the purpose of recognition of UG Dental qualification (BDS) awarded by foreign Institutions/Authorities in respect to Indian students/ citizens will be conducted on 15.10.17 (Sunday) at Lecture Theatre-5, PT. B. D. Sharma PGIMS, Rohtak. The Roll Nos. to the candidates, who have applied for this screening test are being dispatched through registered post. In case the Roll No. is not received by the concerned candidate up to 09.10.17, he/she may contact on Helpline No. 01262-280051 and email id coe.uhsr@gmail.com. It is to inform you that the date of submission of thesis/ dissertation prior to annual examination of MD/MS/M.Ch./ DM/ MDS, 2018-19 is 15.11.2017 without late fee. The concerned Heads of departments and students may be informed accordingly. Please visit university website regularly for further upadate on examination schedule for the year 2018-19 . This is for the information of all concerned that the Nursing Research Statistics (Paper Code 1544) compulsory subject for the students of B.Sc Nursing 3rd 4th Year is common examination, which will be held on 14.09.2017. This is for the information of all concerned that the date sheet of examination of ANM/GNM/MPHW(M) session 2015-16 will be uploaded on the university website shortly. The students are directed to visit the university website regularly for updates. In continuation of "The Standing Committee on Unfairmeans cases considered the cases of under mentioned candidates in its meeting held on 24th May, 2017 and decided as under"
This is for the information of all concerned that for MDS (students of Swami Devi Dyal Hospital Dental College, Golpura, Panchkula BRS Dental College Hospital, Sultanpura, Panchkula) MD/MS (students of Command Hospital, WC, Chandimandir, Panchkula) Annual Examinations, 2017 commencing w.e.f. 13.06.2017 15.06.2017, an Examination Centre has been created at Command Hospital, WC, Chandimandir, Panchkula in place of DAV Dental College, Yamunanagar due to administrative reasons. The Examination Centre for the students of DAV Dental College, Yamunanagar for MDS Course will remain the same. This is for the information of all concerned that the UMC meeting which was to be held on 22.05.2017 has been postponed due to administrative reasons. This will now be held on 24.05.2017. The students are instructed to check the University website i.e www.uhsr.ac.in regularly for any change/ update. List of examination Centres for B.Pharmacy, M.Pharmacy, MD/MS, DM/ M.Ch., PG Diploma, MDS Annual Exams 2017-18 and MBBS 2nd Prof. Supple. Examination 2016-17. UMC meeting scheduled to be held on 08.05.2017 at 3:00 PM is hereby postponded. The fresh date will be intimated shortly. Students are instructed to check the website regularly for the next date of UMC meeting. It is for information of all concerned that the examinations of B. Sc. Nursing, P.B. B.Sc. Nursing, BPT, MPT other para medical courses will be conducted at Examination Hall, Administrative Block, 1st Floor, Pt. 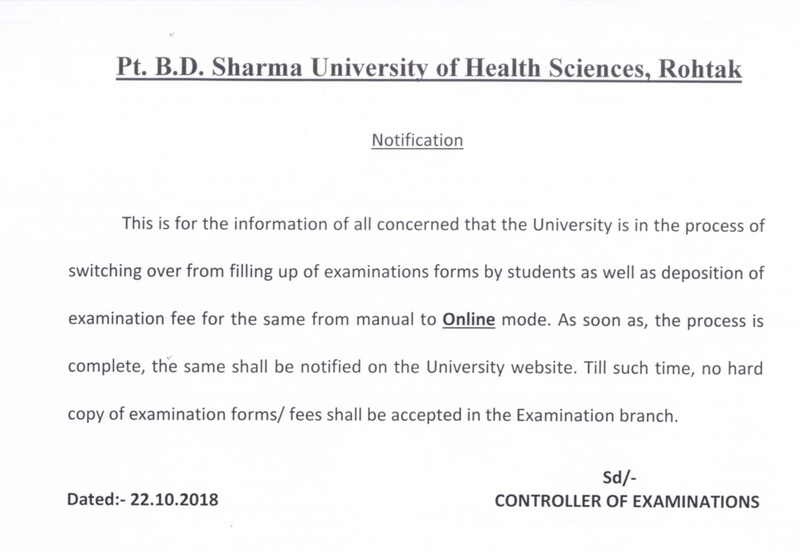 B. D. Sharma University of Health Sciences, Rohtak (University Gate no. 5) in place of College of Nursing, PGIMS, Rohtak only on 29.04.2017 (Saturday). Hence, the Principals of all concerned colleges are directed to bring it into the notice of students appearing into the exams. All the students are instructed to attempt the question paper on separate Answer Sheets as per the instruction given in question paper in the university theory examinations, failing which the answer sheets shall not be evaluated and Unfair Means Case shall also be registered against such candidates. They are also instructed that they should write their Roll Number at the specified place in the answer book nowhere else, otherwise Unfair Means Case shall be registered against such candidates. The Directors/ Principals of all colleges are also requested to bring it into the notice of all the students appearing in the forthcoming exams. Tentative Theory Date sheet for Post Basic B.Sc. Nursing 1st 2nd Year Supple Exams, 2016. 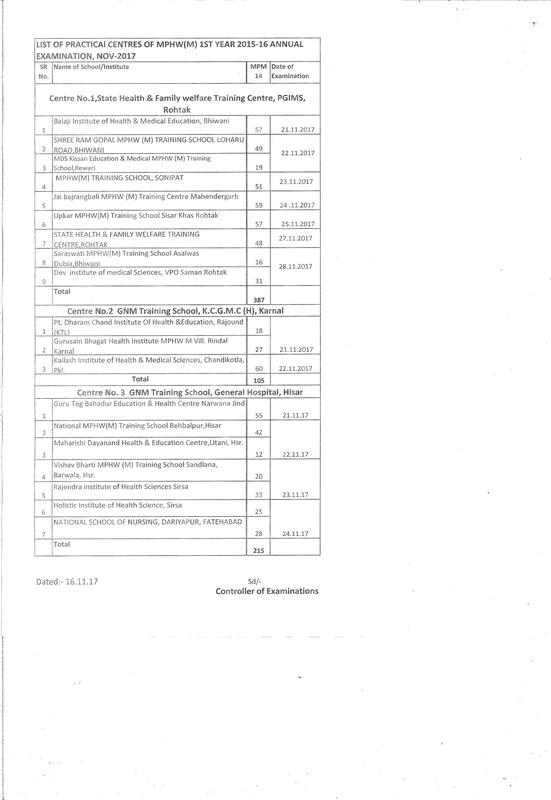 List of examination centres for conducting BAMS, D. Pharmacy and BHMS Annual/Supple. Theory Examinations 2016, commencing w.e.f. 21.03.2017. It is information of all concerned that the examinations of MBBS 3rd Prof. Part ndash;II Supple. Exams. 2016 in the subject of Paediatrics on 16.03.2017 will be conducted at College of Nursing, PGIMS, Rohtak in place of New LT 5 6, PGIMS, Rohtak. Hence, the Principals of all concerned colleges are directed to bring it into the notice of students appearing in the exams. The Practical Examinations of B. Pharmacy 1st to 4th year M. Pharmacy Supplementary, 2016. This is for the information of all concerned that the examination centre for BDS Supple. Exams. 2016 commencing w.e.f. 09.02.2016 has been created at BRS Dental College Hospital, Sultanpur, Panchkula in place CDL College of Pharmacy, Jagadhari, Yamunanagar due to administrative reasons. Tentative Theory Date sheet of B.D.S. 1st, 2nd, 3rd 4th Year Supple. Exams, 2016. The Standing Committee on Unfair means cases considered the cases of under mentioned candidates in its meeting held on 16th, 18th 30th November, 2016 decided as under. Result Gazettee B.Sc. in Radiotherapy 1st, 2nd 3rd Year Annual Exam., September 2016. (Admission Batch 2013-14 2014-15) to be held in the month of November, 2016. This is for the information of all concerned that the University has created examination centre at College of Nursing, PGIMS, Rohtak for BASLP 1st Year Annual and MDS PG Diploma Final Year Supplementary Examination 2016 commencing from 03.11.2016.